is both an intermediate school and an arts school located in Toronto, Ontario, Canada. The main campus of the school was originally known as Lansing Public School #4 (until 1934), and then later changed to Duke of Kent Public School (1934–1949) and also Spring Garden Public School (1949–1980). In 1981 the Claude Watson Arts Program was formed. Claude Watson is the only public arts intermediate school in Canada, and is governed by the Toronto District School Board. Claude Watson celebrated its 25th Anniversary in 2007 instead of 2006 due to the construction and touch-ups of the new building. The school is unique in Canada, simultaneously providing arts and academic education to a total of about 300 students in grades 4 through 8, unlike other arts schools which begin at grade 9. 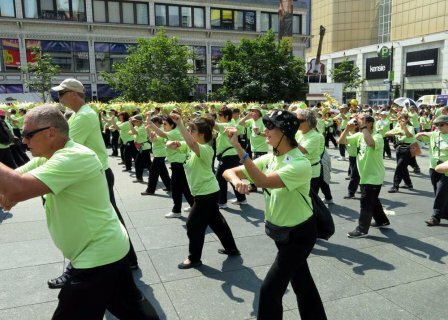 Known across Canada, it has performed at Toronto's 2008 Olympic bid, TTC's 50th Anniversary, the Opening Ceremonies of the 1997 Special Olympics at the Sky Dome, as well, the Claude Watson Stage Band™ has performed at Musicfest Canada Nationals in May 2014 and received a gold medal. Claude Watson attended other numerous cultural festivals around the world in addition to major production partnerships with professional companies like the Canadian Opera Company. Students of the school are often featured in Hollywood movies, TV series, television adverts, and major theatre productions. The Claude Watson program consists of academic and artistic study. In academics, the standard curriculum for each grade level is covered, but in half the time it takes at a normal school. This is because only half of each school day is devoted to academics; the other half is for arts subjects. In spite of this, Claude Watson students consistently score far above the national and school board averages on standardized tests like the EQAO for reading, writing, and math.